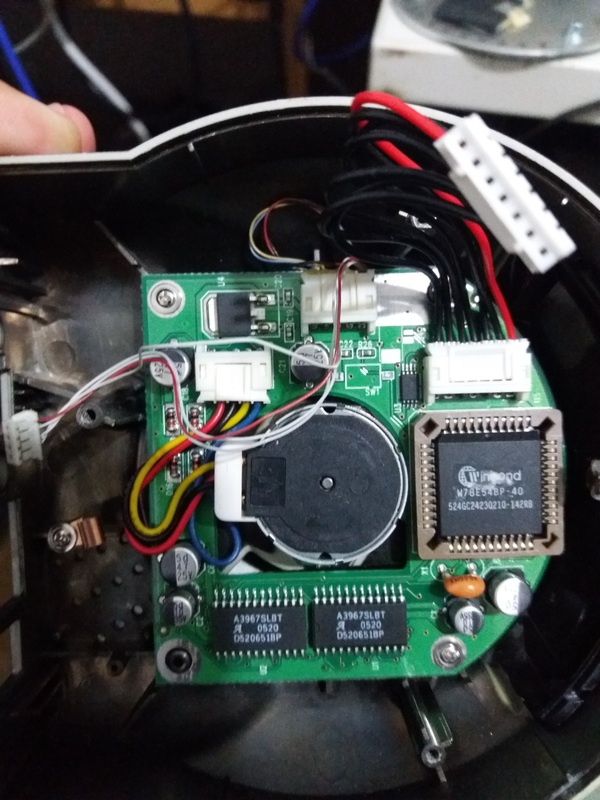 First part of a blog post series about our approach to reverse engineer a Philips TriMedia based IP camera. This is a three parts blog post series in which I'm going to talk about a barely known CPU architecture: Philips TriMedia. This is still an ongoing project in which a first version was already presented at Ekoparty 2018 and was selected for BlackHat Europe 2018. Unfortunately, I couldn't make it for BH for personal reasons but an updated version of the talk is going to be presented at Troopers19. This first part is an introduction to the research project, the first steps that I followed when I found the device and what happened after. The second part will focus more on the architecture itself and the third part will talk about the TriMedia assembly. I hope you like it. Any feedback is welcome, just drop me a line at ncriva [at] quarkslab.com or buzz me on TW (@crackinglandia). Some years ago, a co-worker, Francisco Falcon, and I did a presentation at hack.lu and Ekoparty about hacking IP cameras. That was my first contact with the embedded world. We had a lot of fun and from that moment on, IoT became a very interesting topic for me. That way, each time I got some device, I had to open it and study it. Some months ago, I got a D-Link IP camera, specifically, a DCS-5300. It is an end user's IP camera, mostly for home users to watch what's happening in their house or work when they are not there. This is an old IP camera but it has something very interesting from the hardware perspective. Usually, or at least from what I saw over the years, IP cameras have an ARM or MIPS CPU inside but this is not the case here. This model, and some others from the DCS-5xxx family, have a TriMedia CPU, a very old CPU. Why is this interesting? Personally, it is a new architecture for me and that's great because I can learn new things. However, there is very little documentation about TriMedia CPUs. From what I saw during this research, nobody has docs about it, nobody is allowed to speak about it, nobody is willing to share anything about it, everything seems to be a little bit "scary" and "obscure" about the TriMedia CPU. Why? Well, I really don't know. My bet is that as it is a proprietary CPU, originally from Philips, maybe it is a matter of NDAs. In this post, we are going to talk about the first approach I took with the firmware analysis, then we'll see some analysis of the software and hardware present in the camera, and then, we'll do an introduction to the special CPU this camera has. The first thing I do when I start to analyze a new device is to get the firmware, generally, from the vendor's site. The latest available version of the firmware is A3 1.06 (2009) but I decided to analyze the previous version v1.05, because it is the one I have installed on my camera. 1060755       0x102F93        XML document, version: "1.0"
As you can see in the output, binwalk was able to recognize some HTML, XML and GIF files only. There are also some certificates of what seems to be some Base64 index tables, but there aren't any signs of a bootloader, kernel or filesystems. Generally, bootloader and kernel image tend to be at the beginning of the firmware's image file, but that's not the case. Binwalk also identified something called "Digi International firmware" but we'll see later that is just a false positive. By looking at the graphs, we can see that almost the first megabyte of data has a very high entropy and looking at the variation, we can't totally be sure that it is only compressed or encrypted. Even though I tried to do a more exhaustive analysis of the entropy, I couldn't identify any known algorithm or cipher. At this point, I was sure I wasn't dealing with a common firmware image. The last thing I tried at this point was to look at the strings (strings dcs5300_firmware_105.bin > output.txt) but I didn't find anything that could give me a clue about what I was dealing with. So, I left this approach for a moment (we will see later what this binary blob has inside) and tried something different. HTTP server: This is used for the management of the IP camera. An HTTPS server can be enabled from the web interface but is not turned on by default. FTP server: This is used to access the screenshots and audio the camera can generate. It is the most comfortable way to access the multimedia files. Telnet server: This is used for a more "advanced" management of the camera. Radio Free Ethernet (RFE) is a network audio broadcasting system. It consists of programs and tools that allow packets of audio data to be transmitted around a network. The system is best understood by using the analogy of traditional radio broadcasting. The camera has an incorporated microphone so this service is probably used to broadcast the captured audio. The filemaker (TCP 5003) service is used to stream live video, a kind of RTP/RTSP service. With the D-ViewCam application, we can access the audio and video transmitted by the camera. The transmission is done via HTTP by requesting the video.vam file. The commplex-link (TCP 5001) service is used to sync up the audio and video transmitted by the camera . All these services seem to be custom-made, I didn't find any banner of a well-known http, ftp, etc... server. When connecting to the Telnet server, you have to specify a password. The password is 'admin' (I just tried the default ones, and guess what? I had luck) and cannot be changed by the user in the web interface nor by using the Telnet service. ETH: Ethernet link speed is 100Mbps. We have information about the network settings in the camera (MAC, IP, DNS servers), the status of the different services running, and that's it, not too much more. Scrambled with some of the Telnet commands we saw, there are some strings that seem to be part of other 'undocumented' commands, for example the 'fanon' and 'fanoff', which I suppose are used to turn on and turn off, respectively, a kind of 'fan' inside the camera (this is not entirely true, if you disassemble the camera, you won't find any fan there. This fan is probably present in another device from the same family). There is another interesting command called 'suicide' that is used to reboot the camera. There is also a 'newweb' command that is used to create a new root for the web server. There's not much else we can talk about this service. We get the root of the FTP server and we can't go anywhere from here. This is the only accessible folder for us. Also, as you can see, there aren't many files we can get. Most of the files are 0 sized. At the moment, there isn't too much else we can do with the FTP server. It is mostly used to store all the media (screenshots, audio, video) collected by the camera. The default administrator's user is 'admin' with blank password. As you can see, you can change it in the web interface. Also, you can add different users and restrict them to use I/O and PT functionality. One interesting thing is that there is a 'guest' account available with user 'demo' and blank password. This guest account gives us access to the video stream via snapshots. Unfortunately (from an attacker's point of view), this account is disabled by default. However, some of the cameras I found in shodan.io had the demo account enabled. Nowadays, if you search for a DCS-5300 camera in a service like Shodan, you won't get too many results. The 'User-Agent' reported by the web server is the one used by Vivotek IP cameras, VVTK. Is it the same web server used by Vivotek? Well, I'm not sure but it could be an option ;p given that it shares almost the same CGI API that some Vivotek IP cameras. For example, this is the WEB API provided by a Vivotek PT31x4 IP camera (check the ' URL Commands of the Network Camera' section) and this is the one provided for the DCS-5300. do you see the similarities? As in many other cases, CGI programs are a very good starting point to look for vulnerabilities. Our goal is to have unauthenticated access to the camera through the web administration interface, which tends to be the exposed part to the Internet. Most of the CGI programs listed in the Vivotek's doc aren't available in the D-Link camera and the ones available require authentication. The same happens with the ones listed in the D-Link's doc, all CGI programs require authentication. Some of these CGIs were affected by different vulnerabilities in the past in some other Vivotek IP camera models, as the ones tagged as CVE-2013-1594, getparam.cgi and the parafile.html page . Ok, it seems that we couldn't find any unauthenticated CGI. Then, I spent some time playing with Burp Suite and some of the CGI programs in order to see if I could find a post-auth vulnerability, mostly a remote command execution, to have access to the internal file system and that way have access to CGI binaries. I tried the most common issues as path traversal, semicolon injection in places like the DDNS, NTP, config, but due to the lack of output I wasn't sure about the success of the commands. I needed to go deeper, it was time to open the device. I decided to open the camera. I was hoping to find an interface like UART or similar in order to have access to the file system through a shell. This is what I found. The camera has two PCBs. The biggest has almost all the interesting components we can find in a device like this (CPU, RAM, Flash, etc) and the small one has some chips for the PTZ functionality. 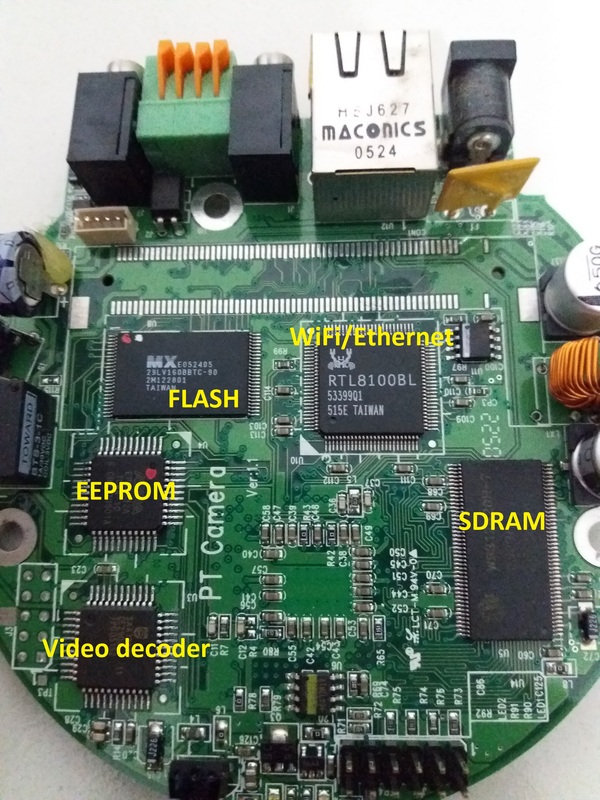 We have 128 MB of RAM, WiFi/Ethernet capabilities, 16 MB of Flash, a small video decoder and an EEPROM chip. On this side, we can see that we only have a big chip identified as Philips TriMedia PNX1300EH (32-bit processor). This is the reason for this post and we'll have a specific section dedicated to it. On this side, we can see a Winbond W78E54BP-40 and two Allegro A3967SLBT chips. All this stuff is used to move the engine of the camera and blink some LEDs. As you can see, most of the hardware in this camera is what anyone expects to find in a device of this kind. There isn't anything special about it except the fact that the CPU is not what you commonly see in the IP cameras sold today, most of them use ARM or MIPS CPUs. 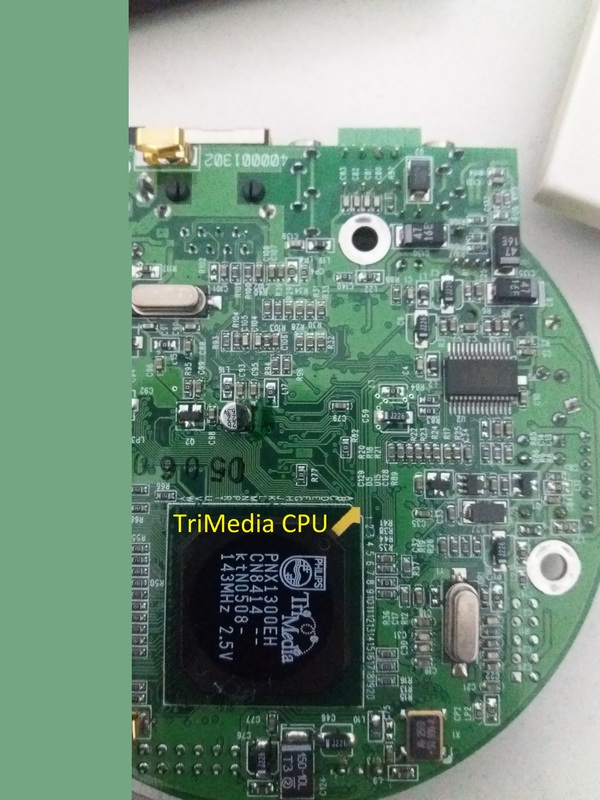 Before going into some details about the TriMedia CPU, let's talk a little bit about the pinout found on this device. Even though we got some information about the nature of the signals, we cannot get too much detailed information with a voltmeter in this case. The right tool we need in this case is an oscilloscope. With a scope you can check the basic nature of a signal (VCC, GND, Pulled-up line, numeric signal) and guess its parameters (max voltage, frequency, etc). At that moment, I didn't have that tool in my hands, I was armed with only a voltmeter and a Bus Pirate. 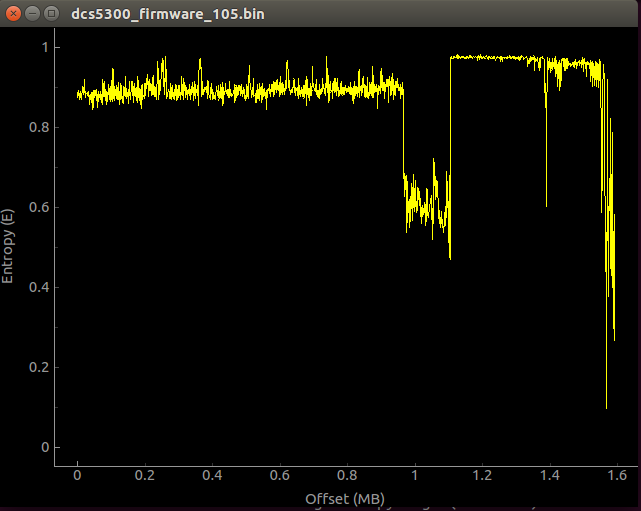 Even though it's possible to build a cheap oscilloscope using a Bus Pirate, the bandwidth and sampling rate aren't good (5720 samples per second; in practice, gives a maximum measurable frequency of about 1kHz). At the end, in order to continue with this work, I bought a PicoScope 2204A but that will be a subject for another post. Just as a side note, there exists a JTAG PCI debugger for TriMedia microprocessors offered by Monument Data Systems that can be used to debug the code running on this CPUs. I'm not sure if it is useful in this particular case, but it is good to know that we have more options. TriMedia microprocessors were originally manufactured by Philips, currently known as NXP (Nexperia) semiconductors (Qualcomm announced the acquisition of NXP in 2016 ). It is a family of VLIW  (Very Long Instruction Word) processors, which means they can execute a given number of instructions in parallel at the same time, with a Harvard architecture  and its main use is for DSP (Digital Signal Processing) . At the very beginning, TriMedia processors were designated with the acronym 'PNX' and then it was changed to 'TM'. TriMedia microprocessors run a real time operating system known as pSOS. Also, there has been some efforts to port the 2.6 Linux kernel branch to run on TriMedia CPUs  . In order to program code for TriMedia microprocessors, there is an official SDK that includes everything you need (libraries, compiler, debugger, simulator, etc) but is not available except for the big companies that sell products using TriMedia processors, D-Link and 2Wire, for example. However, there are some TriMedia compliant SDK as the one offered by Streaming Networks, known as IADK (Integrated Application Development Kit), specifically designed for the PNX1300 family series. Also, there are some development boards equipped with TriMedia CPUs that can be acquired if you want to play with this processor, for example, the TriREF development board offered by Streaming Networks. However, this kind of board, which includes the IADK, is not cheap. In fact, I contacted Streaming Network and asked for the TriREF board and it costs around US $5,000, a lot of money that I can't afford. At the time of this study (January 2019), I looked for other options on the market, but they did not include the SDK. If you want to read more about TriMedia microprocessors, you can refer to its corresponding Wikipedia entry. In this post, I'm going to refer, specifically, to the TriMedia PNX1300EH microprocessor. Hopefully, all the information provided here can help you to research other processors of the same family. To reverse engineer a TriMedia processor is not an easy task, especially due to the lack of documentation and tools. There is a very little documentation on the Internet about the TriMedia architecture, the instruction set documentation is poor and the existing tools are private and expensive. Anyway, there are some old sources of information we can use in order to start our journey. The first source of information to start the research is the datasheet. This document includes information about all the architecture of the processor. We can get the main idea of the different components in the chip, how they interact, the specific instruction set used by the controller, etc. If you want to start with the right foot, you MUST read the datasheet. Another good source of information, although specifically about JTAG research, is http://hackingbtbusinesshub.wordpress.com. Even though the blog is not available anymore, there are still some copies stored in web.archive.org   . This guy did an excellent work reversing 2Wire routers, which are based on TriMedia CPUs, and creating some excellent tools as 2wiglet (based on urjtag, a JTAG wiggler tool for 2Wire routers and tm32dis), a TriMedia disassembler for the TM32 family. The TriMedia JTAG tools are designed to work only with a proprietary JTAG cable. The ‘cable’ is actually a sophisticated piece of programming equipment. It is a USB device that connects to the PC via a NetChip NET-2282 peripheral controller. The programmer boots from its own EEPROM and is driven by a Philips PNX1502 CPU with NOR flash and DRAM memory. As you can read in the release notes, the processor module is only available upon special request. I requested the processor module from HexRays but they no longer offer it. Finally, during this research I collected different kinds of information about TriMedia (doc, tools) and stored it on a github repo. In this first part of the series, I introduced the Philips TriMedia architecture. I used the IP camera as an excuse to talk about how it is to research a TriMedia based device, what and how much public information resources are available regarding software and hardware and how to deal with its magic ASM. Thanks to all my Quarkslab colleagues who proofread this article and provided valuable feedback.